Some of the students from Tyndale Christian School, with Principal Nigel Croser and Salvationist James Leigh, showing off their awards presented by The Salvation Army. 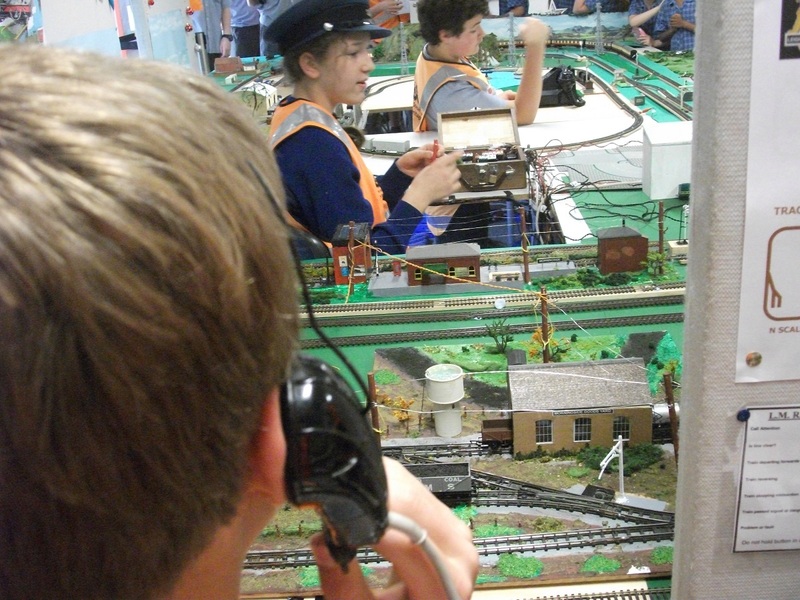 For the second Christmas running, Students at Tyndale Christian School in Strathalbyn, South Australia, assisted James Leigh from Mount Barker Corps run a model railway display to raise money for The Salvation Army’s Christmas Appeal. Students running the train display for the fundraiser. Following his childhood hobby of model trains, and his passionate desire to help those living rough on the streets, James and nine student helpers put together a working display of model trains for students and staff at the school last month. The train display, with seven tracks this year, up from three last year, was open for viewing at lunchtime for four days, in a room decorated to reflect the Christmas Appeal. James, who graduated from Tyndale last year, involved interested students in making parts of the display, such as the goods and engine sheds and tunnels, as well as running the viewings. He also taught the students about model trains and how to operate them, with topics including electrical wiring, electronics, painting and photography. James also made sure the students knew about The Salvation Army and “why we help people”. 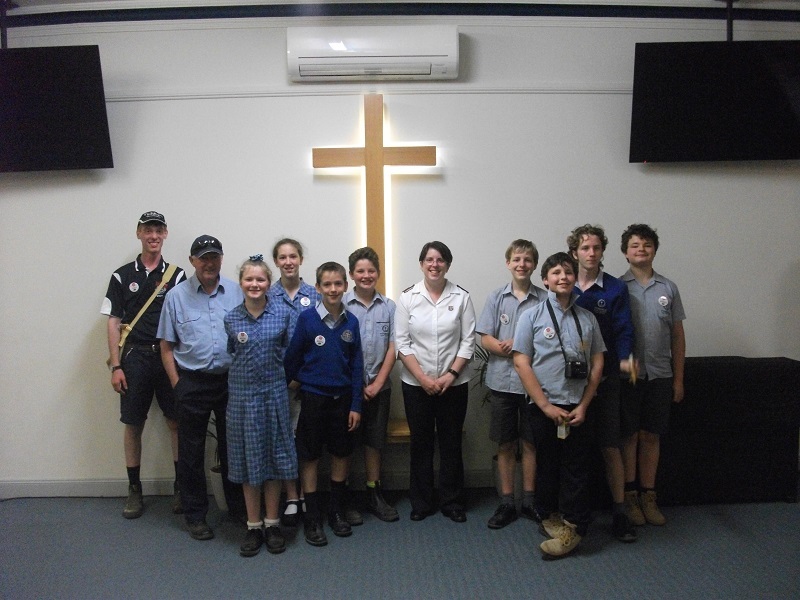 As part of preparing the students for the fundraiser, James and school personnel took them on a Model Railway Club excursion, which included time at the local Mount Barker Salvation Army. The group stopped first at the Strathalbyn Railway Depot, looked through the carriages and goods shed, and made sure they filled in their checklist of things to find there! James (back left) with the students and Lieutenant Sarah Innes at the Corps. They also visited the Mt Barker Railway Depot, heard a talk about the SteamRanger Heritage Railway and enjoyed a guided tour of the railway depot where they saw heritage steam locomotives being restored and maintained. At the Mount Barker Corps, Lieutenant Sarah Innes, Corps Officer, gave the students a tour of the corps building and explained what goes on during the week to help people. A Salvation Army brass band played at the school assembly to launch the fundraiser. Major Barry Shearer presented a Christmas message to the students. During the lunchtime train viewings, students could run the trains using small change. They could also purchase train badges. “I find it’s a great thing to use a hobby of mine to help those in need and students to learn new skills and have fun while doing so,” said James, who volunteers as a design and technical assistant at the school. The students also loved being involved. “It’s fun, it builds confidence and I get to drive a train!” said one Year 7 student. “I enjoyed the mixture of raising funds for poor people to have a better Christmas and playing trains so to speak (and also getting out of class! ),” said another student. And, “I want to help raise money, that’s the main thing, but I love trains also,” said another. The final fundraising result was $377.85.